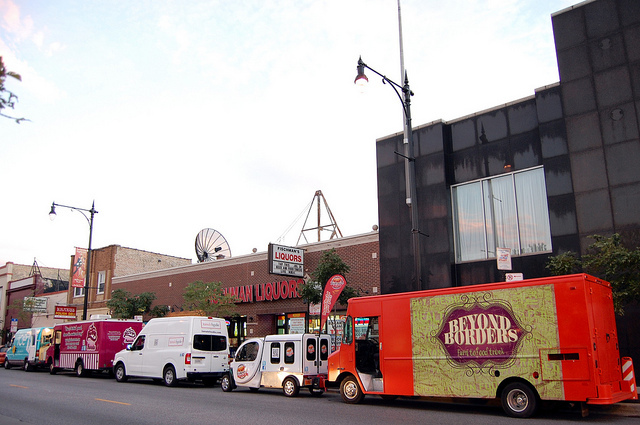 Go Northwest, young food truck: Is Jefferson Park the next Wicker Park-Bucktown — or Austin, TX? Is Chicago&apos;s Jefferson Park the next Wicker Park-Bucktown? It could be, if 45th Ward Alderman John Arena&apos;s big plans work out. Arena cast the only vote against the controversial new food truck ordinance, approved by the City Council Wednesday. "I think restraint of trade is what this ordinance serves up,” he said just before the vote. “A brick-and-mortar restaurant lobby got a hold of it and it was stuffed with protectionism and baked in the oven of paranoia." I attended and live-tweeted the hearing, which you look back at starting here. Ald. Arena likely meant the cost of new required GPS and doubled fines for all. Yes, food trucks can now cook on board, but at what cost? The mystery substitute ordinance was finally posted on the City Clerk&apos;s website after the vote, so let&apos;s take a moment to talk about what it says. What you won&apos;t find in there are any details on the new GPS system — like cost — or the new food stands — like locations. The new ordinance was effective immediately except the new doubled fines, which take effect within ten days. As expected, the existing 200-foot rule still stands, but has been clarified, meaning a food truck can&apos;t park within 200-feet of a restaurant’s street-level principal customer entrance. So no more questions about how to measure for a highrise or pedway restaurant. But food trucks can now serve within 200 feet of a church, school or school playground while school’s in session, which were all previously banned. And, as added in the committee hearing last week, food trucks can&apos;t run from 2 a.m. to 5 a.m. or on vacant lots — or evidently on lots of vacant buildings, which I discovered on careful reading of the ordinance. Food trucks can run within 200 feet of a restaurant, between midnight and 2 a.m. — for now. But back to the Northwest Side. I spoke with Ald. Arena after Wednesday&apos;s meeting to discuss this calzone of protectionism and paranoia. Here&apos;s some of what he had to say. What about the food truck nights at Fischman&apos;s? So when are you opening these food truck corrals? But the new ordinance says no food trucks on vacant lots even with the permission of the owner. What happens if the owner is the city?